The last time Sonic and Robotnik when head-to-head, Sonic blasted Robotnik's Death Egg to smithereens. The explosion heaved Sonic deep into Floating Island's Mushroom Hills! Sonic knows that many Emeralds, including the Master Emerald, are hidden somewhere on Floating Island. He bets the Knuckles character knows where they are! Sonic can't let Robotnik get his hands on the Master Emerald. He'd have Death Egg fuel forever - and Floating Island would be destroyed! Now Sonic's got two problems. How to protect the Master Emerald? And how to keep Knuckles off his back? He'll have to deal with that wild echidna right away! Knuckles has problems, too. As Guardian of Floating Island and all the Emeralds, Knuckles has a mission - to wage war on all invaders. Whoever threw that bomb is in DEEP trouble. Knuckles is ready with tricks, traps and bare-fisted attacks to keep Floating Island sage. Sonic's not taking any changes. Neither is Knuckles! But while they're going the rounds with each other, who's stopping Dr. Robotnik? Could this be the end of Floating Island? 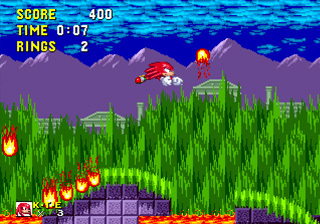 Having had its relaunch interrupted by the efforts of Sonic and Tails (the events of Sonic 3), the Death Egg plummets back down onto the mysterious island from whence it came. The enormous aerial base crash lands, conveniently enough, on the peak of an active volcano. Sonic and Tails, meanwhile, land safely in a lush mushroom forest deep in the island's interior. Shortly after his descent to terra firma, Sonic notices the island's guardian and all-purpose troublemaker, Knuckles the Echidna, sneak out of a hidden thicket. Curiosity piqued, Sonic investigates the thicket and finds a giant, multi-coloured Super Ring. He leaps in and finds himself whisked away to a massive underground cavern. In the centre of the cavern lies an intricately detailed and remarkably well-preserved ruin: the Chaos Emerald altar. In the middle of the altar lies a humongous green jewel - none other than the Master Emerald, the legendary "stone of power" that destroyed the echidna civilization. As Sonic gazes in awe at the beautiful gem, the seven Chaos Emeralds are whisked from his grasp by an unseen force. The Emeralds oscillate violently in mid-air and, with a blinding flash, return to their pedestals around the Master Emerald. Knuckles is left with the task of rescuing the recovered Master Emerald from the relentless pursuit of a rogue Eggrobo (or perhaps several Eggrobos). Each Level is cut up into 2 Acts Apart from Hidden Palace, Sky Sanctuary and Doomsday which each have 1 Act. Followed Sonic 3 in having a Mini Boss fight for Act 1 and the Main Boss fight for Act 2. Get a Box- When the Sign post starts to fall down and you can bounce it around a bit, press down to duck right under it. It will do a small bounce and give you a box every time. 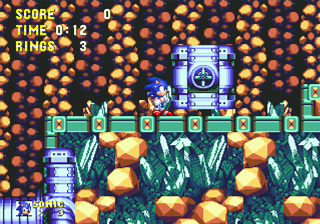 * Due to Time and Size, Some Levels were Removed from Sonic 3 and put into this game. * It is made to lock-on to another Cartage so you can play the Complete Sonic 3 OR Sonic 2 with Knuckles as the Main Character. If you locked-on to anotherGame, you were giving Sonic 3 Style Special Stages as a Mini-game. * The Metal Sonic in this game is often rrefereedto as Mk2, and is NOT the main one as seen in Sonic CD. 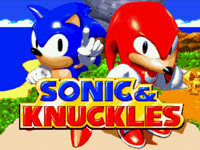 Knuckles in Sonic The Hedgehog! 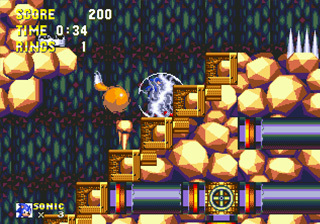 In an early Build (while SnK and Sonic 3 were still one game) the second act of Lava Reef carried on the Colour setup while in the final build, the colours change to be Hidden Palace Colours. In an early Build (while SnK and Sonic 3 were still one game) the start of the Lava Reef act was a little harder as not only did you have to climb some steps and dodge fire balls but falling spikes too! It was probably removed for being a little too tricky for the start of the level and the fire balls were enough.